Sitting on the campus of Scott High School, the Museum of Scott County is truly a step back in time. The student-built, student-operated museum is the only one of its kind in the U.S. and captures the pioneer heritage and spirit of Scott County. Started as a single building, the museum has grown to include several acres of authentic pioneer-era buildings that were moved to the campus piece by piece and reassembled. Next door is the USS Tennessee Battleship Museum, a memorial to the ship that survived the attack on Pearl Harbor. Many pieces of authentic memorabilia are on display, along with a number of photos taken as the ship was used in active duty. 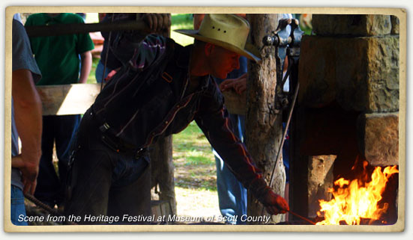 The museums are the site of the Appalachian Heritage Festival each September. They’re also open for tours by the public. To schedule a visit, call 423-663-2801.